Houston's not the only area suffering from extreme weather. People walk through a waterlogged street following heavy rains in Mumbai, India, Tuesday, Aug. 29, 2017. Heavy rains Tuesday brought Mumbai to a halt flooding vast areas of the city. Right now, all eyes in the US are on Houston, Texas, which in the last week has seen rampant rains and flooding after Hurricane Harvey came ashore. But there's another natural disaster on the other side of the planet that's far largers and deadlier. Monsoon rains in India, Bangladesh and Nepal have killed more than 1,200 people, while millions of people are stranded and in need of aid. Here are 18 photos of how people are coping there. A man is carrying his kid with some food and walking through the flood water. village of Gaibandha, Bangladesh. August 19, 2017. Gaibandha is a district in Northern Bangladesh. It is a part of the Rangpur Division. Gaibandha is one of the districts of Bangladesh which got badly affected by recent flood mainly in the village areas. A woman in Sariakandhi area at Bogra, Bangladesh, August 16, 2017. Flood victims on makeshift banana rafts collect biscuit packets distributed by government officials in Pokoria village, east of Gauhati, north eastern Assam state, India, Monday, Aug. 14, 2017. 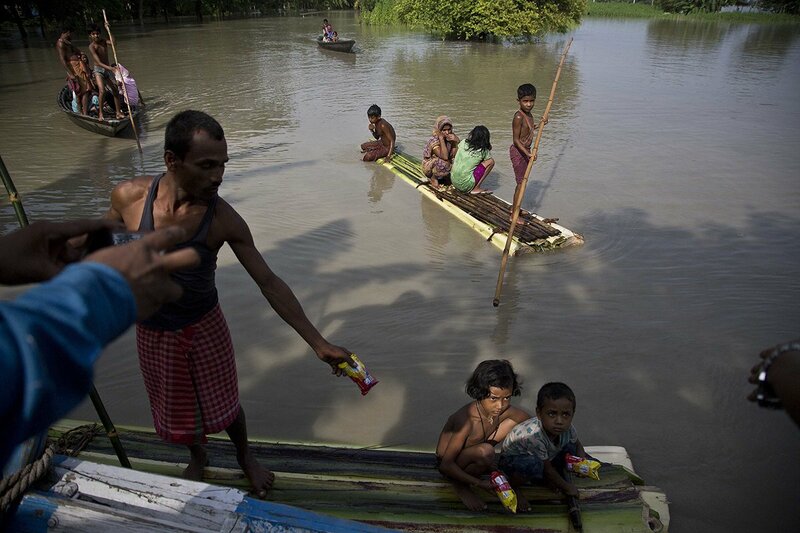 A man is carrying her important households through flood water in a flood affected village of Gaibandha, Bangladesh. August 19, 2017. Indian flood effected villagers collect drinking water and relief food at Alal village in Malda district in the Indian state of West Bengal on August 23, 2017. The human toll is steadily rising across India, Nepal and Bangladesh following the latest in a series of deluges since August 10, as the annual monsoon hits the north and east of the region. A woman is carrying her important households through flood water in a flood affected village of Gaibandha, Bangladesh. August 19, 2017. A woman stands high-deep in flood water inside her submarged house in Guthail, Jamalpur, Bangladesh, on August 19 2017. Indian villagers are seen on a boat next to other vehicles along a flooded state highway at Chachol village in Malda district in the Indian state of West Bengal on August 23, 2017. 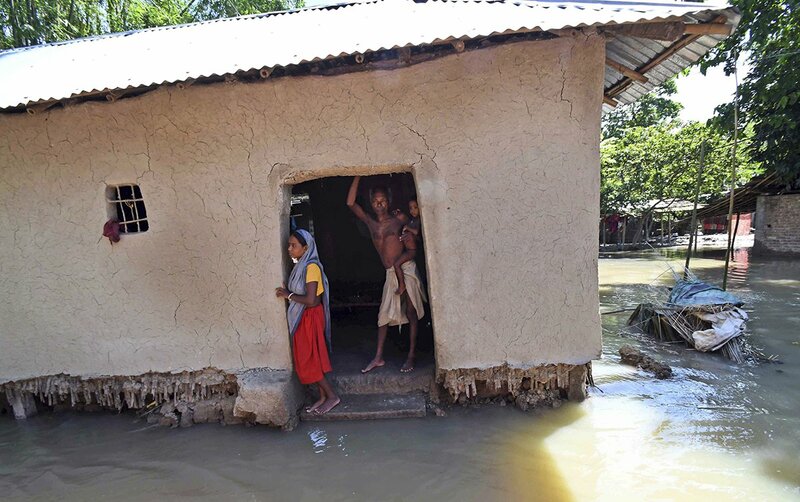 Villagers stand inside their house destroyed by floodwaters at Katihar district, in the eastern Indian state of Bihar, Saturday, Aug. 19, 2017. Indian residents affected by flooding naviagate flodwaters to collect relief materials in Udaynarayanpur, some 83kms west of Kolkata, on August 1, 2017. Medical officials of the Jhargaon Public Health Centre (PHC) travel on a boat on their way to hold a medical camp in the flood affected Morigaon district, in India's northeastern Assam state, on August 18, 2017. Indian people wade along a flooded street during heavy rain in Mumbai, India on August 29, 2017. An Indian man wades along a flooded street during a heavy downpour in Agartala, the capital of northeastern state of Tripura, on August 11, 2017.